Although individuals with sickle cell anemia ostensibly have a monogenetic disease, they exhibit wide variability in the degree of clinical severity. One of the most powerful and reproducible predictors of disease severity is the level of endogenous fetal hemoglobin (HbF), composed of two gamma-globin and two α-globin chains. Expression of HbF is reduced in infancy and little is known about how this regulation is accomplished. A better understanding of gamma-globin regulation could aid in the discovery and design of a specific gamma-globin inducing agent. Taking a genomics approach to this question, Dr. Vivien Sheehan and her team investigated the natural human variation and its correlation with HbF levels to identify novel genes important for gamma-globin regulation. In this webinar, she describes how they performed whole exome sequencing (WES) and used gene-based analysis to find correlations between rare variants and endogenous HbF levels. T1 testing found seven unique non-synonymous variations in a Forkhead box O transcription factor, FOXO3, to be significantly associated with lower HbF (p=5.6x10-4, β-value ln HbF -0.66). They verified the association between FOXO3 and endogenous HbF levels in an ex vivo model of erythroid differentiation from CD34+ cells isolated from peripheral blood called primary erythroid culture. These results strongly suggest that FOXO3 is a positive regulator of gamma-globin. 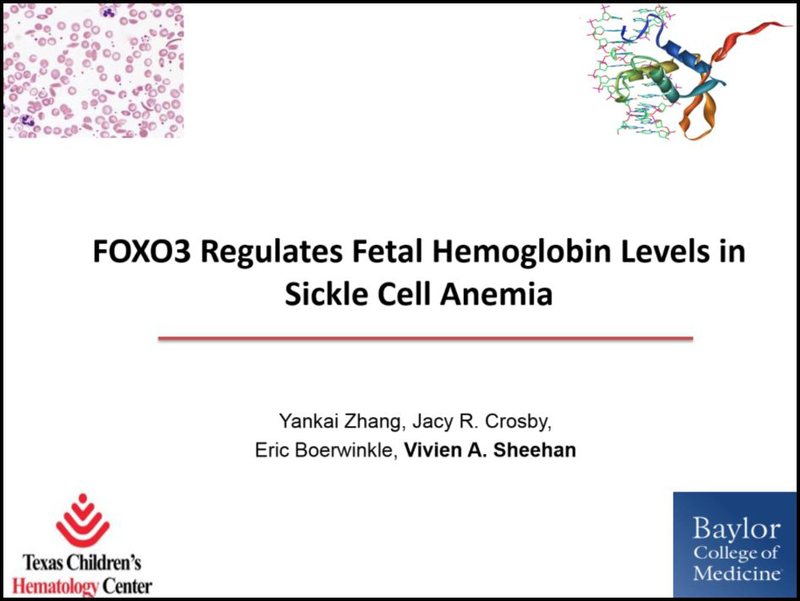 The gamma-globin specific effect of FOXO3 is critical; FOXO3 is an excellent therapeutic target for the treatment of sickle cell disease, as it selectively induces HbF, which does not sickle, without inducing HbS. Also, FOXO3 does not delay erythroid maturation, instead actually promotes erythroid maturation. Taken together, the results indicate that FOXO3 is a positive regulator of gamma-globin expression and an excellent therapeutic target for fetal hemoglobin induction. Their findings support a new mechanism underlying fetal hemoglobin regulation and help identify potential new HbF inducing agents. Dr. Vivien Sheehan is an Assistant Professor in the Department of Pediatrics for Hematology-Oncology at the Baylor College of Medicine. Dr. Sheehan earned her M.A. at Emory University and her Ph.D. in Biochemistry at Texas A&M University. Before coming to Baylor, Dr. Sheehan completed an Internal Medicine Hematology Fellowship at the University of Tennessee Medical Center. Currently, her research is focused on sickle cell disease, with projects ranging from clinical research to basic science.